With the SEC charges settled, Diamond can focus on improving its business. Diamond Foods (UNKNOWN:DMND.DL) has a tainted past that continues to haunt the company. An accounting scandal in November 2011 allowed rival Kellogg (NYSE:K) to beat Diamond in the race to acquire Pringles from Procter & Gamble. In addition, the packaged-food landscape is highly competitive, with giants like ConAgra Foods (NYSE:CAG) and others in the fray. Therefore, the loss of Pringles has possibly continued to hurt Diamond, as it missed a chance to increase its product lineup. Management, however, is optimistic about a bright future. It agreed to pay $5 million to settle U.S. Securities and Exchange Commission charges for cooking the books and can now focus on growing the business. Mr. Market seems to have responded favorably to the settlement news. 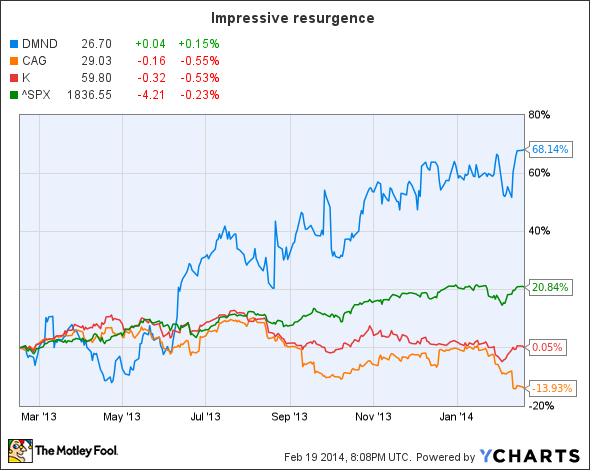 The stock has outperformed the market and peers in the last year, as shown below. But can it sustain the momentum? Let's take a look. Diamond Foods has been trying to turn around ever since suffering a blow from the accounting scandal. During its fiscal first quarter, Diamond sustained the momentum that it has seen recently. Its gross margin expanded by 200 basis points to 24.7%, fueled by a combination of net price realization, cost reductions, and productivity improvements. In the first quarter, nut sales were a disappointment, declining 17.1% year over year, although partly offset by a 1.2% year-over-year increase in the snacks segment. Nut sales declined mainly due to a shortfall in supply. As a result, net revenue declined 9.2% year over year to $234.7 million. Diluted earnings per share were $0.18 as compared to $0.24 a share last year. In addition, Diamond is on track to deliver cost savings of between $35 million and $40 million across fiscal 2013 and 2014, primarily from procurement and manufacturing productivity. Also, the company expects that it will generate year-over-year earnings growth in fiscal 2014 and consolidated top-line growth from fiscal 2015 onward. On debt refinancing, as per Bloomberg News, Diamond Foods has refinanced the rate on a $415 million loan lower. This will help in improving earnings going forward. What are peers up to? Similarly, Kellogg is also targeting cost cuts through its $1.2 billion-$1.4 billion 'Project K' restructuring program. This initiative is expected to yield annualized savings of $425 million-$475 million by 2018. This should fuel growth during the next four years. However, Kellogg is witnessing weakness in its cereal business in developed markets. Consumers are switching to healthier ways of eating, focusing on natural and organic food items. As a result, revenue in the fourth quarter of fiscal 2013 declined 1.7% year over year. In order to win back lost consumers, Kellogg is innovating. For example, in 2014, it has a strong pipeline of new products, including Special K Chocolate Almond, the Krave cereal, Touch of Fruit Mini-Wheats, Bear Naked granola, and new Kashi cereals. This also includes three varieties of Organic Promise, all of which are GMO, or genetically modified organism, free. Whereas Kellogg is innovating, ConAgra is relying on its private brands for growth. In the snacks business, where ConAgra has a big presence, it is seeing good growth, particularly after the Ralcorp acquisition. Ralcorp also forms much of the private-brand portfolio of products. Overall, for the second quarter, net sales clocked in at $4.7 billion, up 27% year over year, driven primarily by the Ralcorp acquisition. More of the same is expected to continue. However, from a turnaround perspective, Diamond is indeed doing well, and the market has duly rewarded its efforts. As the company continues to execute its different plans and grow the business following the settlement of SEC charges, investors can expect further gains. Hence, investors should continue to hold the stock in their portfolio, as Diamond can deliver more returns in the future.